I made a doll quilt before Christmas and realized I’d never posted a tutorial on this quick and easy binding method. 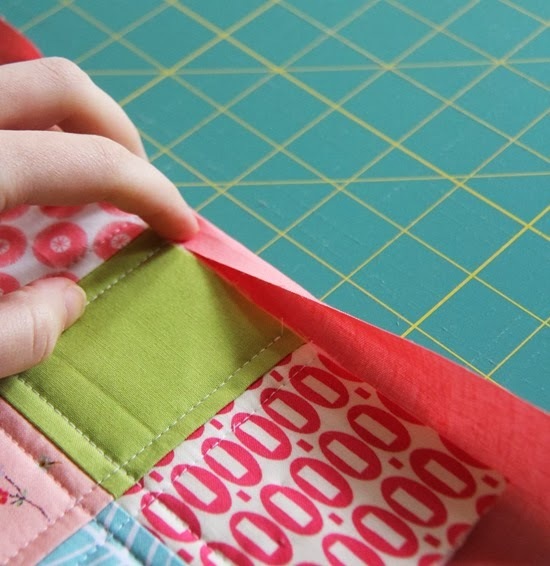 Since I know a lot of you are beginners…this is a really great way to dip your toes into binding a quilt. 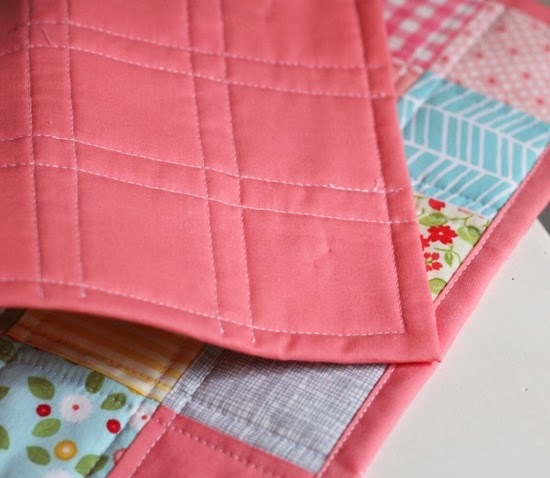 I especially love it for small things like hot pads, table toppers, or a mini quilt. 1. Baste your quilt. Normally I would cut the batting the exact same size as the quilt top…but in these pictures using this method was an afterthought. Believe me though…it’s much much easier to start with the batting the same size as the quilt top! 2. Quilt like normal…except make sure none of your stitches go into the batting. Start and stop all of your quilting stitches on the quilt top and backstitch. 3. Carefully cut the batting away (if it was a bit larger than the quilt top). 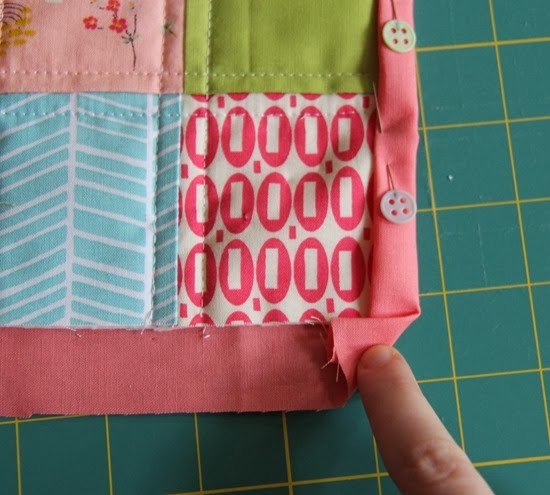 This is tricky if you’ve quilted to the edge…which is why I recommend keeping your batting the exact same size as your quilt top before you start. I’ve cut through many backings by accident doing this! 4. Trim the backing fabric, leaving 1” around all sides of the quilt top. …and then in half again, and pin. You can do this on your ironing board and press it as you go…it makes it very simple. Fold all the way down to the next edge. …and in half again to make a nice mitered corner. Pin it in place. You might have to play with the corner a bit, but once you actually do this it will make sense. Continue until you’ve folded and pinned the binding around the whole quilt. 7. Sew it down using a walking foot, right along the edge of the binding. Sew to the corner and leave the needle in the fabric as you lift the presser foot and turn to go down the next edge. Easy as pie. 1. It’s hard to square up the quilt and keep the edges nice and straight. So I only use this on small things. 2. You have to plan so your backing fabric will also look great as your binding fabric. 3. If you quilt to the edge of your quilt top…you’re going to see it in the binding of the quilt on the back. I normally wouldn’t quilt to the edge using this method and instead quilt 1” away from the edge or so…but it was an afterthought with this little quilt. And there you go…an easy way to do bindings! If you’re a beginner who is mastering bindings…here’s my other tutorial on a Machine Binding a quilt. That´s a perfect idea. Thank you so much for that. thanks for this tip – your instructions were very clear and helpful – will try this out on my next small quilt. Great tutorial. I'm a newbie when it comes to quilts so this is really useful. Thank you. Thank you for great tutorial. I was wonderring how to do this so I am so happy I can try it. Thanks. I have tried to do this before but I didn't know how to deal with the corners! Thanks so much. 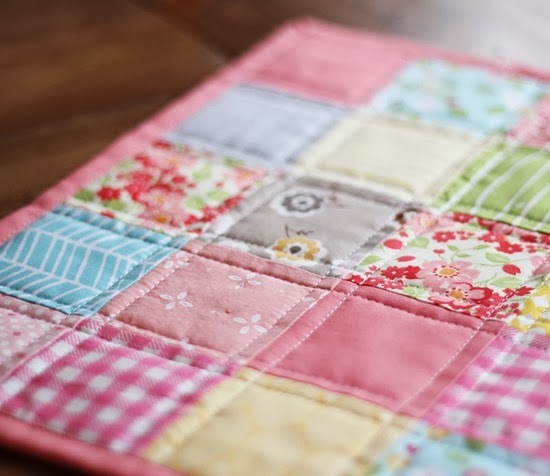 Such a pretty quilt and love the quilting ~ straight lines are the best! I've done this method a few times but usually on a smaller quilt. It really saves time and looks great too! Awesome tutorial. When I first started quilting this is how I did it because I didn't know about binding at all! Excellent toot!! Crystal clear instructions and great pics! Very cool trick, and a super cute choice in fabrics too! This is great. Thanks for the binding tip! I'll have to make a table runner just so I can try this technique out. haha Where did you get your pins btw? They are so cute! Great photos…and a great technique! I am going to try this! Thank you so much for this, I will be giving this a try soon. Thanks for the great tutorial! I'm always looking for binding shortcuts! Your tutorial is so clear and your photos are so helpful! This helps me SO MUCH!!!! I create miniature quilts and all is beautiful, but I'm terrified of BINDING!!!! Tee, hee. Nice of you to share your expertise with us, beautiful doll quilt. Thank you for teaching me this! I've learned so much from you on your blog. All the way from how to piece together batting to sewing together HST's with using tape. Your pictures are lovely. Thanks again for taking the time to share with all of us who are learning but don't have a physical person close who knows how to quilt to show us! I'm a handquilter and I've been binding all my quilts this way for 30 years or so. The only thing I do different is when I fold the 1" of backing over, I slide the edge under the batting about 1/8" of an inch. That way, when I make the second fold a double layer of binding covers the quilt edge. I was looking at one of my daughter's quilts the other day that I made in the mid-80s. The binding has worn thru so I need to replace it. This time, I'll use bias binding just like I would on any old quilt that needed a new one. It looks really good! Thanks! I was just about to do this on a baby quilt, and it turned out great. Thanks for the help! Thanks for sharing… especially the photos of how to do the corners! I will be sure to give this a try. 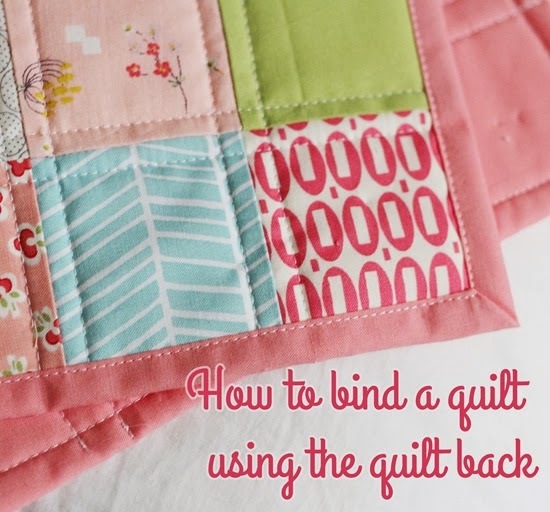 This is my favorite way to bind a quilt! I'm featuring this at my frugal sewing site Sewistry next week: http://sewistry.com/2014/01/cheaper-way-bind-quilt/. Please let me know of any concerns. Thank you for inspiring me to try this method. For baby quilts and quick ones, it sure saves time. Thanks for sharing this method. I am a beginner sewer and will certainly try this on a future baby quilt I am going to try. I will work my way up to piece binding when I have more confidence in my sewing. I hate to make a mistake in sewing as it is a more expensive hobby than say crocheting or knitting where one can frog it. This method works really well with Mugrugs. Great tutorial! I was especially interested in how the corners were handled. In the way old days we used to bind all our quilts this way. Now that some of those quilts are approaching their third decade, the edges are wearing out. And now it's not easy to re-bind them. I know no one plans to have quilts around for 20+ years, but it happens. One day you wake up and that quilt is still here, but now with worn edges that need a new binding (quilt is still going strong). Having older quilts around gives a perspective on solid vs. shoddy construction, too. Glad you mentioned your dislikes. Since I'm an older quilter, I see also what time does, too. I love reading your blog, but don't always comment–you have such fresh and beautiful designs (esp. love your new patterns!). I love this! Thank you for posting it! I plan to make one. One funny thing, I kept wondering why you were adding a button to the binding! I thought maybe you were just showing the width of the binding. Finally, while showing my daughter, I realized it was part of the pin! Thanks for this great tutorial! I am about to do this on a baby quilt. Glad I found your photos and detail on how to fold the corners! I just found this post when I asked google how to self bind a quilt. Thank you for this. I am now helping at church to make quilts that we send Lutheran Word Relief for charity. I wasn't sure if I did the mitre corner right. When I read your post, I found out that I did it right. Hi – I just finished a summer pinwheel table runner, backed with a printed seersucker (yay for the clearance rack!) and found that this tutorial was perfect for a small project like that! Thank you! I love this idea. I am a newbie quilter so I really want to try this. Allison, this is my favorite way of binding a quilt. I have done it this way since I began two years ago despite never having seen it done. I had seen only strip bindings where you have to do the bias folding. Well, once I saw in my own studio the easiness of this method, I was sold. Just like tying instead of trying to quilt on my tiny Singer. Love your blog, your designs, and your openness and sharing. Thanks very much. Thanks for the tutorial. This is a great way to bind little items, like coasters or mug rugs. Thank you for this clear tutorial! I found it on a google search. I've messed up so many corners of self-bindings over the years! I never could seem to get the folds to stay right. My latest project turned out perfectly. This was the way that I first learnt to bind quilts back in the 1980s and was glad to move on to present day methods. However, it's a very good way for quick, machined binding instead of having to sew by hand on the back. Thanks for the reminder. Thank you so much for the tutorial. Is it possible to use this method for large items such as a lap quilt? Thank you again for inspiration and lessons. God bless. I have been struggling with this problem for a while and could never get a neat finish. Then I found your post which is the clearest that I have found and now have no problem finishing my quilts. Thank you for a helpful post. I found your blog via Pinterest and so glad I did. This is exactly what I have been searching for. I am a very new beginner quilter. A friend of mine started a quilt for my little guy. She started the binding using the backing and she started by hand stitching. Well it was taking soooo long for her to finish this quilt (that I had every intention to do myself but she decided she was going to make it, well insisted) after months of waiting for the quilt I finally went and picked it up and insisted machine sewing would be faster then hand stitching. Considering I stay so busy with our farm the little one and our rescue kennel I didn't want to hand stitch this quilt with all the dogs and a little one always wanting right in the mix of things. I can't wait to get this quilt finished which was suppose to been done before Christmas ☺️ Now I will definitely be getting on This today !!! Thanks so much for all your tutorials they are all so helpful to us beginners and ALL of your quilts are just beautiful !! Thank you so much for this tutorial, this is a nice and quick way to complete small projects. By the way, at mitered corner, I did cut off some fabric to reduce the bulk. Perfect, clear instructions, this technique will be well worth trying on small items. Thankyou for sharing. Thanks for the clear and concise tutorial. I’m also a newbie. 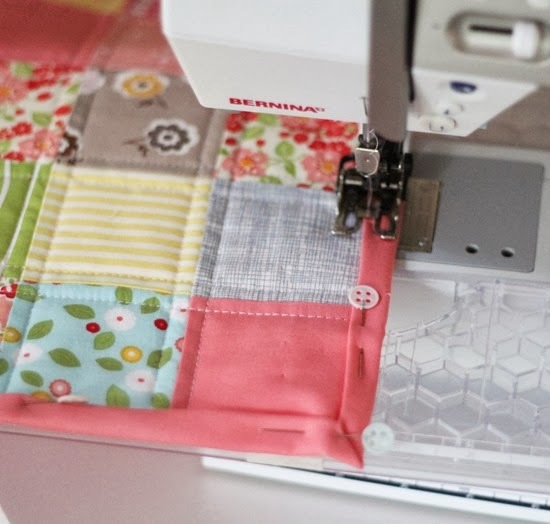 You do say to use this technique on small things and everyone has a different idea what a small thing is, so a baby quilt or lap/throw size or smaller? thanks again. I will certainly attempt to try this. Would it be okay to link to your binding tutorial on our guild blog page. I love how simple you make this look. 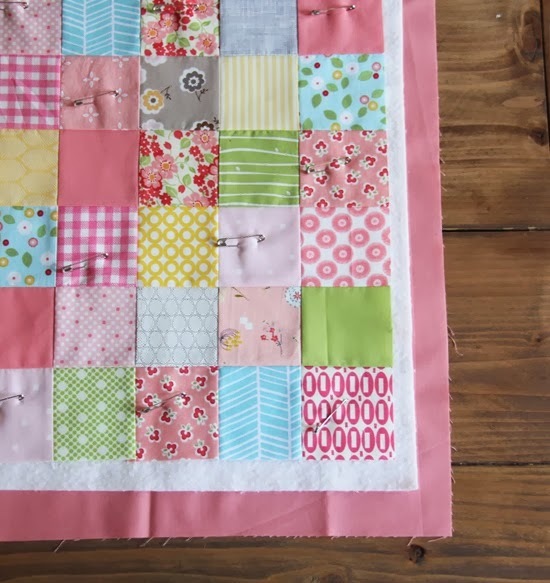 Thank you, I’m about to start my first ever quilt and this method looks very neat and certainly less daunting. 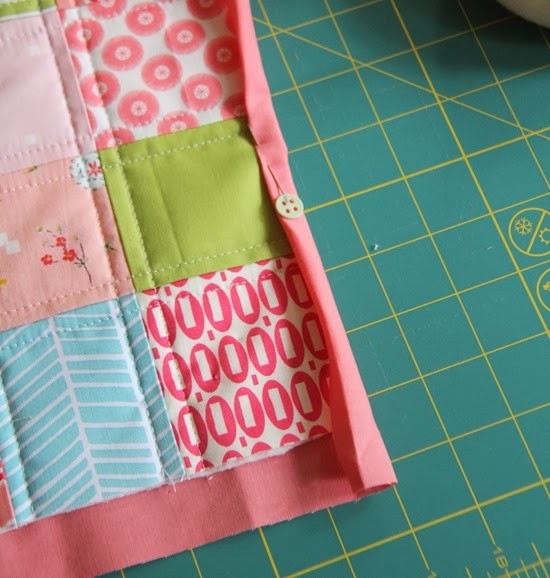 I love the way you machine quilted the squares! and thank you for the easy to understand tutorial using back piece as binding. Working on a toddler size one tomorrow and needed this instruction! After using this method on a large quilt, I will never go back to any other. 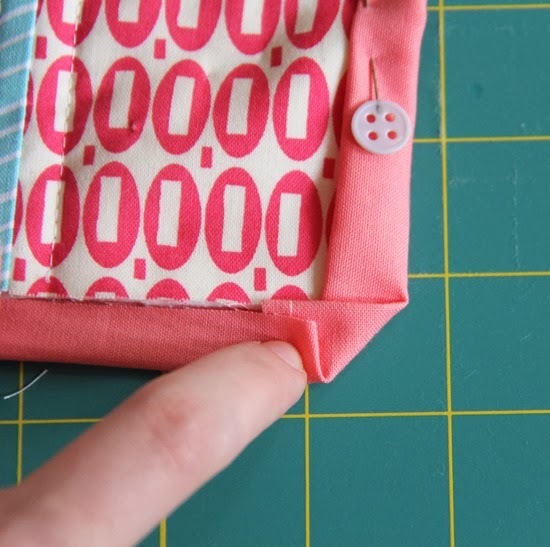 It’s easy and the best part is that you don’t have to piece together fabric to make a binding. Thank you! Just beginning quilting and loved this binding method. Helped me get my first project done quickly and easily. I am a beginner and haven’t started my first quilt or binding, but I could totally follow your tutorial! Thank you for leaving in your mistakes! makes it easier for a beginner like me to remember the tips and see to not do the same thing! Thank you so much I just finished my first baby quilt with your method I think this will work for table toppers. Thank you for your simple instructions on finishing corners. Very valuable and helped me to finally finish a quilt that has been on the go for 6 years! thank you for sharing this! i usually bind my quilts the traditional way, so whenever i decide to use this method i have to check back on your site to refresh my memory. today, however, i must have food on my brain, because i opened this post and started scrolling down through the text and photos, looking for the recipe. when i realized there wasn’t a recipe for christmas cookies (or whatever i was subconsciously looking for), i had a good laugh. so thanks again! Saved my life. I’ve always used binding strips and self binding a pair of pot holders threw me for a loop! Just couldn’t figure out what to do with all of the extra fabric at the corners. Thank you! I’m so glad it helped!! I accidentally cut the backing fabric in 2 places when trimming the batting. Is there any way to still bind with backing? You’d have to stitch it back together where you trimmed it off, tricky but possible! I love your pictures and explanations. Thank you. My question: My backing is Cuddle fabric and I’d like to make a fairly wide wrap to the front for the binding. Would it work to leave the batting larger than the quilt top so it will help give body to the trim? I’m thinking of making 1.5 inch binding with the quilt back. Newbie here, working on my first quilt top still. I plan to bind this way eventually, but step 2 is confusing me. “Quilt like normal…except make sure none of your stitches go into the batting. 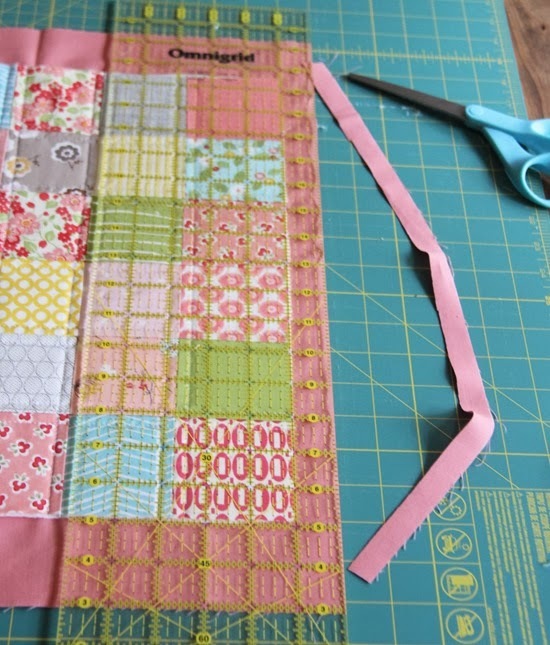 Start and stop all of your quilting stitches on the quilt top and backstitch” Isn’t normal quilting stitching through all 3 layers, top, batting, and backing? Kellie, under photo 2, I think she means don’t branch off into the batting that extends beyond the quilt top in that photo. You are right, you do need to quilt through the three layers. 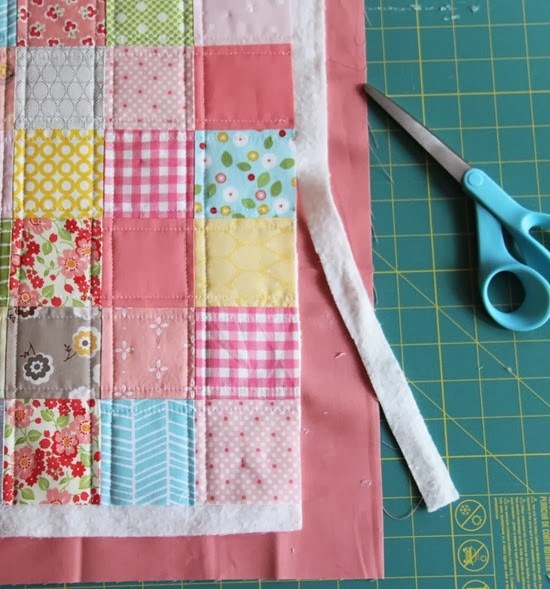 Traditional binding methods are best but this is a quicker method for smaller projects. Sorry I didn’t see your comment Kelli! Yes Marie is right, usually when you quilt you start and stop off the quilt top on the batting. In this case though since you are going to be cutting the batting away, you need to be able to fit your scissors in between the quilt back and batting to cut it away, and if there is stitching on the batting it’s really hard to cut it away! Hi. I am a beginner sewer for the past 35 years! 🤣🤣🤣 I was really never taught how to sew, I just always try to fumble through spontaneous sporadic projects.👍 So, I’m sorry if this question seems dumb but I really did think about this long and hard before asking. In the above, you say something similar to you “normally wouldn’t quilt into the binding zone” and then continue on to say ~ “to measure 1inch from the quilt edge (inward) and quilt to that line.” I get it. The idea is to stop quilting one inch from the edge of the top piece (the pieced side) and then the quilting will not run into the back fabric as it’s turned on itself to create the binding. Right? But here’s where my thinking went, if you measure outward on the back fabric, 1 Inch from the edge of your completed quilted top piece, cut it, then fold it on itself, then that reduces that fabric to a measurement of 1/2 Inch, then it’s that 1/2 Inch that is then folded over the top quilted piece to become the binding. Do you see where I’m going with this? So…. I’m thinking that means my securing seam (sewing the “binding” through all of the fabrics) means that my “binding” seam will be approximately 1/2 Inch from the overall quilt edge. Not 1 Inch. So, if I had stopped my quilting runs 1 Inch from the edge of my top piece, that means all of my quilting will stop short of that “binding seam” by 1/2 Inch. Am I totally wrong in my thinking? Because I don’t think that’s what you want, right? The idea, I think, is to have the quilting meet the edge of your binding seam and not cross into it but also not to be short of it either. Right? So…? Is the answer to quilt to 1/2 Inch (inward) from the top piece edge, if we use your cut measurements? Or is the answer to cut the back fabric at 2 inches from the edge of top piece, fold over itself, leaving 1 Inch to then be folded over the top piece, thus the quilted seams, which according to instructions are stopped at the 1 Inch mark, will then meet that binding seam? Or…….again,…. am I totally way off and not understanding? Thank you for the tutorial I kept trying to follow directions in a book, the picture was small & I just didn”t get it. Following your pictures for turning the corners helped and now I have nice corners on my charity quilt. Keep up the good work, I really enjoy your blog. I’m so glad it helped! Thanks for this tutorial! I am about to try on my first (mini, doll) quilt. 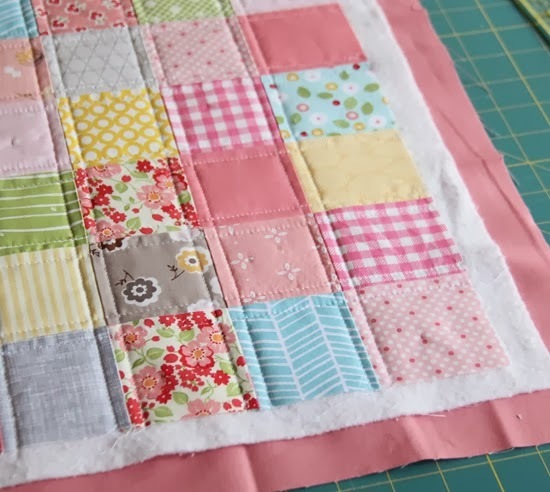 I came across your tutorial on mitered corners months ago with a particular quilt and loved this technique. Now I’m back at it with another quilt that called for this, but couldn’t remember how to do it, so I searched the internet for three and a half hours to find you, and YAY! I did! Thank you for the easy to follow instructions and gorgeous photos! So great! I found and used your Machine Binding Tutorial on my very first quilt and still use it. Thanks so much. Hi Donna! Sorry for the late reply! Fleece doesn’t fray like normal cotton, so you would be fine only folding it over once. The only reason you might want to fold it over twice is if you want a nice finished looking edge. 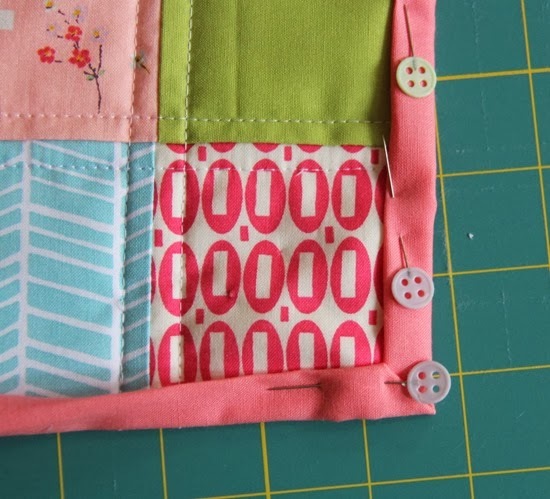 I’ve used Minky with this method and only folded it over once, and then I did a zig zag stitch along the edges to secure the binding for decoration and to keep the edges from being too raw.